As flavorful as the culture that created it. The aroma of barbecuing with our Jamaican Jerk dry rub is distinctly exotic and provides a complex jerk flavor that is sure to please. Quality Jamaican Allspice, Chinese Ginger, Indonesian Mace, sweet Paprika from Hungary and other quality spices and herbs blended with raw sugar for that island flavor and smell you would expect on the islands as well as your kitchen or back yard grill. Also available in gift baskets and gift sets, click here. 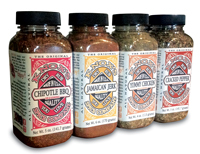 Sprinkle Knox's gourmet Jamaican Jerk dry rub seasoning over pork, chicken, beef, fish, game or vegetables. Rub, as the name suggests, to infuse flavor into the surface. If you like to keep your hands out of it, place meat in a zip lock bag. Sprinkle with dry rub and rub from outside the bag. Can be applied several hours before grilling and refrigerated until ready to use or directly before barbecuing. Our Jamaican Jerk blend can be mixed with citrus juice, olive oil or vinegar and used as a marinade or wet rub. Below are some of our favorites. • 2 cups of orange, lemon, lime or grapefruit juice. You may use any combination of citrus you like. Personal favorite, 50% orange juice – 50% lime juice and used to marinate pork steaks. Mix citrus juice and our Jerk BBQ rub together in a bowl. Pour over chicken or pork 3 hours before cooking. Keep refrigerated while marinating. Marinating chicken and pork in a zip lock bag will provide easy clean up. Mixing Knox's Jamaican Jerk dry rub with liquids create wet rubs. If you use butter, make sure butter is melted but not hot. Mix together melted butter or oil, lemon juice and Knox's Jamaican Jerk dry rub. Spoon over beef, chicken or pork and rub into surface or place contents in a zip lock bag and massage. BBQ immediately or place in refrigerator until ready to cook. The name Jamaica comes from a word of the Arawak Indians, "Xaymaca", meaning land of wood and water. Jamaican Jerk has roots with the Arawak Indians as well. Many moons ago in Jamaica, indigenous Indians and runaway African slaves cooked meat slowly in pits coated with a spice mixtures as a way of preserving it. The term Jerk may have come from the word Jerky which is another way of preserving spiced meat. Who knows. Jamaican Jerk BBQ rub is wildly unique because of the mixed cultural backgrounds found in Jamaica and availability of very special spices and herbs from all over the world. An excellent, aromatic and intensely flavorful blend of herbs and spices. From as few as 3 to as many herbs and spices as 30. Common to Jamaican Jerk is Jamaican Pimento, commonly knows as Allspice. This sweet pungent flavor, similar to nutmeg and cinnamon, is used as the base for jerk rubs in Jamaica and the tasty but hot Habanero pepper adds a little bite. There is nothing like it! 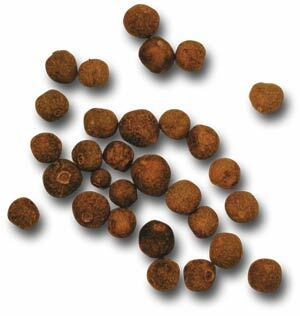 Traditionally used on wild boar, Jamaican Jerk is widely used for fish, chicken, beef and wild game as well. Jamaica has a very colorful past that includes being a port for the transport of herbs and spices from all over the world. Chilies from Mexico, Ginger from China, Paprika from Spain, raw sugar from Cuba, Clove from Indonesia and pretty much whatever else you can think of. Jamaican food has a distinct tropical and exotic flavor because of this. Access to a wide variety of ingredients mixed with the locals expertise with grilling meat, created the first jerk BBQ rubs of distinction. A traditional Jamaican Jerk rub could be as simple as Jamaican allspice, Habanero peppers and salt or as complex as a highly guarded 20 or 30 ingredient rub recipe. Jamaican Jerk is used dry and as a paste when mixed with oil or citrus. Both are excellent. Knox's Jamaican Jerk dry rub takes world spice availability to heart when creating our tropically delicious Jamaican Jerk rub. Aromatic Jamaican allspice, thyme, cinnamon and cloves balance the spicy cayenne, black pepper with the slight sweetness of raw sugar. Exotic and slightly smoky flavor provided by Spanish smoked paprika and Indonesian mace. The flavor is pulled together and drawn together with just the right amount of gourmet sea salt. Sea salt aids in the retention of liquids so your BBQ is moist and succulent.